Florida’s Center for Autism and Related Disabilities (CARD) at Florida Atlantic University (FAU CARD) has announced the launch of Autism Florida. Autism Florida is a new statewide website designed to serve as a central point of access to information on autism to help families, individuals with autism spectrum disorders (ASD), and the professionals who serve them. Autism Florida offers simplicity of use and ease of navigation to locate information about autism quickly and find resources in Florida that can help from the time of suspecting autism through screening, evaluation, treatment, and transitioning to adult years. As a centralized, single entry point for Florida autism information, the website provides a directory e-resources, websites, specific topics, and a list of frequently asked questions (F & Q). Links to existing resources include information from Florida’s Center for Autism and Related Disabilities (CARD), state agency websites, the Dan Marino Foundation, and other organizations. The website was developed by the Florida State University Autism Institute at the request of the Governor’s Task Force on ASD in collaboration with CARD and the Florida Department of Health. The Task Force recognized the need to create a website to provide Florida Families easily accessible and useful information about autism and related disabilities. 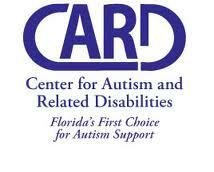 Autism Florida is a work in progress and content will be added and updated regularly. Florida’s Center for Autism and Related Disabilities (CARD) has provided services to individuals with autism and related disabilities, their families, and to the professionals who work with them since 1993. CARD’s purpose is to enhance the lives of individuals by helping them become valued members of their communities. CARD offers supports within the natural contexts of homes, residences, child care programs, schools, and communities at no cost. The Florida State Legislature allocates funds that are administered to the following seven regional CARD sites through the state’s Department of Education.